If there was one thing I was never really expecting to see this season it was a camo, but I was totally wrong! Camo is making a comeback, folks. Most people are asking whether they should go with camo or plaid, and everyone is pretty split. Personally, after going to catholic high school where I wore a plaid skirt everyday I tend to stray away from it as much as possible these days. However my favorite fictional character from a movie is Cher Horowitz, for those of you that are unaware she is famous for wearing a certain yellow plaid ensemble, so I have to leave a little room in my heart for plaid still. Camo, however, I have no prior feelings for because it’s just not something I’ve really worn before. I thought it was reserved for those in military service or perhaps a hunter. So this all begs the question if this look was meant to blend in, what’s making it stand out this season? My theory is with monochrome being really in right now, as well as wearing different shades of the same color (thanks 50 Fifty Shades of Grey) camo is just a natural progression. The good thing is green is a neutral color that pairs well with most basics you probably already own. Most of my friends are wearing camo jackets, which makes sense. A military jacket in camo is a no-brainer, but luckily they have come out with some fashionable ways to dress up this look such as adding studs and detail on the collar. A simple camo shirt for layering is also fantastic because it pairs so well with so much and adds a little detail to your basic henley. I would totally put a vest over this camo henley pictured above. 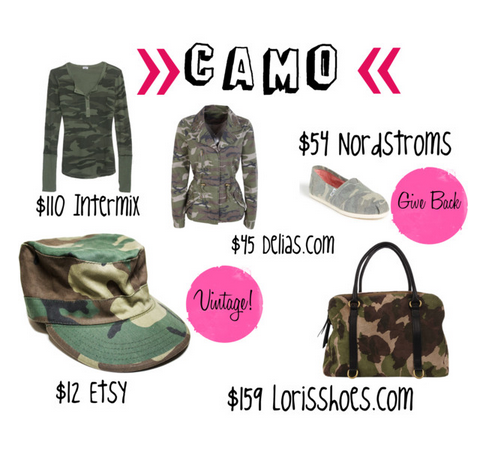 If you’re not ready to go all out in camo, no worries, there are subtle ways you can add it into your look. A camo hat is a great idea because it has a little more character than your average winter hat. I would suggest checking out a thrift store to find one because I tend to see a lot of them there. If not, Etsy has some on its site so check those out, and they tend to be under $20, so it’s practically a steal. A camo bag is also a simple way to add this fabric into your wardrobe. What I like about the one pictured above from Lorisshoes.com is the camo has a cleaner look to it. I feel like it makes the camo more feminine and its on a huge bag with tons of compartments I can use, so I’m definitely a fan! Last but certainly not least are a pair of TOMS in camo. TOMS gives a pair of shoes to a child in Africa everytime you buy one yourself. With the holiday season upon us, what’s a better way to give back with your purchase than this? Camo shoes make a great gift for yourself or even a male in your life because they are gender neutral. It’s nice to way to add a little color to the boring one-color shoes you would probably wear in place of these if you had them in your closet. Wearing camo this season is all about standing out.